A sign indicates a store is open in flood-damaged Lumberton, N.C.
Jay Price reports on the slow recovery some cities are going through after Hurricane Matthew. Almost five months after Hurricane Matthew struck Eastern North Carolina, leaving 26 people dead and an estimated $1.6 billion in property damage, part of the long-term recovery has just gotten under way. But local officials are hoping that a federal program that buys flood damaged homes doesn't destroy established neighborhoods or strain municipal budgets. The program administered by the Federal Emergency Management Agency allows owners of flood damaged homes three options, all aimed at ensuring that a house in a vulnerable place doesn’t have to be repaired again after another big storm. Owners may have the choice of rebuilding their home on the same site, raising it higher to avoid floods, or accepting a buyout, in which FEMA acquires the house and demolishes it, leaving an unbuildable vacant lot behind. FEMA pays, but local officials decide which of the three allowable options will be offered to residents of each neighborhood. “Although all three of those are potential opportunities for homeowners, I would say in Lumberton we're going to be very targeted on where buyout is an option,” said Brandon Love, the planning director and floodplain administrator for the city. 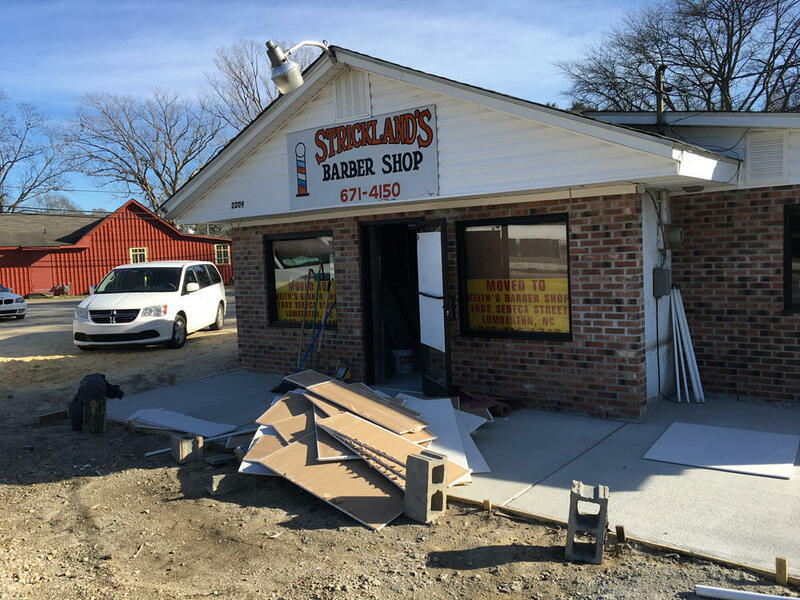 A barbershop in one of the neighborhoods that flooded in Lumberton, N.C. The store closed and is being rebuilt. In Lumberton – one of the cities hardest hit by Matthew, officials have received more than 150 preliminary applications so far for the FEMA hazard mitigation grants, and it’s possible that a few hundred more homes may be damaged badly enough to qualify, Love said. The reason Lumberton and other towns and cities in the flood zone are careful about buyouts is that they can have downsides that cut right into the heart of what makes a community work. After buyouts, homes are knocked down, and the lots are forever preserved as open space. The homeowners can then take the money and buy a home on higher ground, where they won’t have to worry about the next hurricane. But remaining residents can see their friends leave and their neighborhoods diluted by the so-called "checkerboarding" of a missing house here, and another there. Property values can drop. And the effects can be hard on cities, too. During a tour of a flood-damaged neighborhood in West Lumberton, Love pointed at a vacant lot between storm-damaged homes. A city program had removed a long-derelict house there before the flood. Some of the effects are similar to what happens in a flood buyout, he said. The city has to keep the lot cleaned and mowed, and it loses property taxes and other revenue. “You don't have folks that are contributing to buying water, buying sewer, buying power,” Love said. “So from an economical standpoint, it really pulls down on the city's resources to offer services." That means Lumberton will probably make buyouts available for only a few dozen houses at most, he said. Those would likely be on land where flooding is common and where it makes sense to create open space, such as adjacent to a park or a city facility like a water treatment plant. 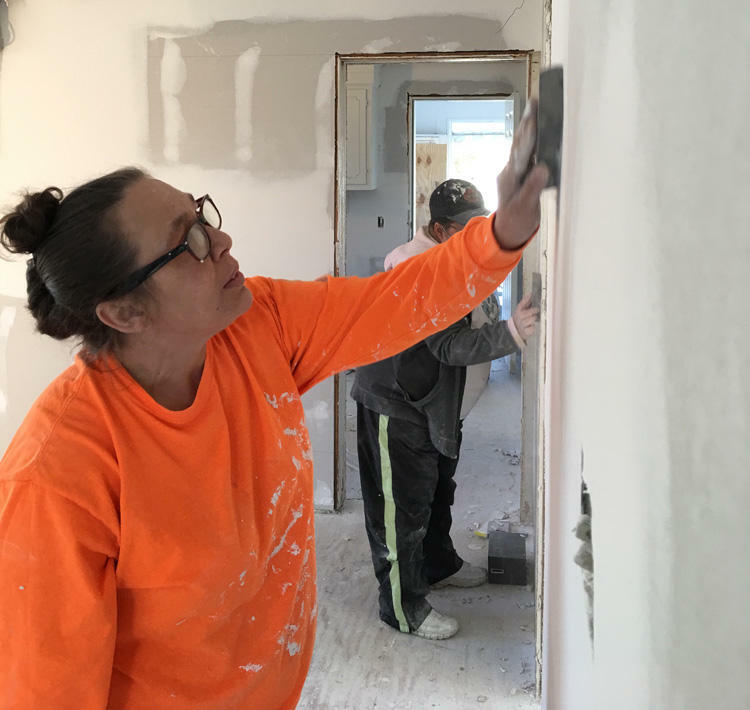 Carol McMillan and Tammy Locklear are drywall contractors from Pembroke, N.C., working on a flood-damaged home in Lumberton, N.C. This week, nearly 790 families of Matthew survivors still were living in motels as part of a federal temporary housing program. State, federal and local officials just finished a round of meetings with residents in the worst-hit areas, like Lumberton, Princeville and Fayetteville, to explain the FEMA’s grant program for badly-damaged housing and help them begin applying. In the next few weeks, recovery officials will evaluate preliminary applications from homeowners for that program. They’re also working with other state and federal programs for badly-damaged homes. Last month, the Department of Housing and Urban Development sent $198 million to the state for community development block grants. Most of that — $159 million — is going to Cumberland, Robeson, Edgecombe and Wayne counties to help there with housing, economic development, and measures to reduce damage in future storms. And in December, the legislature authorized $200 million in state funding to help storm survivors find housing and to help with other recovery needs. In places like South and West Lumberton, damaged public housing projects and entire neighborhoods of gutted private homes remain empty, and local officials are still working overtime on the recovery. More than 350 families from the area were still living in motels last week. Hundreds more are staying with friends and relatives. Love used to have to deal with floodplain issues only a few minutes a week, if that. Now, as he helps coordinate reconstruction, that part of his job can eat 50 or even 60 hours a week, keeping him on the phone, in meetings with homeowners and other officials involved in the recovery efforts, and driving around the city to check on stricken neighborhoods. In West Lumberton, Love says the houses got two to four feet of water inside. That’s enough to destroy the wiring, appliances and drywall, and ruin insulation. Regardless of whether residents are bought out, rebuild, or relocate, it could be six or seven months before the hazard mitigation money starts flowing, he said. Between that and the various other relief programs, it’s possible not every home will be repaired. All the reconstruction may take two or even three years, he said. As someone who knows how all the pieces are coming together, Love says part of him wants to counsel flood victims to be patient. “But that's hard for someone who's lost their home, who has two or three kids, and has been living in a hotel for six months,” he said. “You know, your patience is gone." Time that’s weighing heavily on survivors stuck in motels, or packed in relatives’ spare rooms. Linda Oxendine, Lumberton’s public services director and tax collector, was planning to retire Dec. 31. But the storm hit, so she decided to stay as long as it takes to help the city recover. She tries to help flood survivors in motels find rental housing and is sometimes out until 8 or 9 p.m., checking on them. She hears daily from flood survivors still stuck in motels who are anxious or depressed. “You’re in a very small hotel room with two beds, and you may be in there with three or four kids,” she said. And with daily worries that aren’t a problem for people with homes, like laundry, or cooking even a simple meal. Housing is scarce, even for 95-year-old evacuee. Among those Oxendine is trying to help is the Killens family. Greg Killens travels a lot for his job, installing sprinkler systems in large buildings. “Me, I’m used to living in a hotel because I go from state to state in my work, but I never thought that I would be taking care of my grandmother and my mother and my wife in a hotel,” he said, sitting on the side of a bed in the motel room where he and his wife, Kristen, have lived for months. As he talked, Kristen, a school teacher, was tapping away at her laptop. “I’m just looking online for whatever might be available,” she said. The search for a rental home or apartment is a constant activity for those stuck in the motels. They have to keep looking as a condition for the FEMA program that pays their room bills. But rental property was scarce before the flood, and now anything that becomes available is snapped up quickly. The federal program that pays for the hotel rooms could end soon. FEMA has extended it at the state’s request, but it runs out March 4 unless the state asks for another extension. Kristin Killens said that at least her family has some means to pay rent if they find a place. The Killens family owns four modest houses on the same side of town, all of them severely damaged. A Christian volunteer group is helping repair the one that belongs to Greg Killens’ grandmother, Lela Thompson. The family is hoping that the FEMA hazard mitigation program will eventually fix the others and at least lift Thompson’s higher, if not rebuild it entirely. In their neighborhoods many homes are owned by the original residents or their children. Killens said his family won’t ask for buyouts, and he’s hoping none of their neighbors get them, either. They want their home back, and their community, too. ‘“A lot of people feel like, that’s nothing but brick and mortar,” said Greg Killens. “No, it’s not. To some folks, that’s about their heritage, where they come from." Killens’ mother died of cancer the month after the flood. Thompson, though, is still two doors down in the motel. At 95 years old, she had never spent a single night in a motel and hates being away from her house so much that in the past she would only visit relatives for one night. But she never had to wade out of a flood, either. That changed her perspective on motels. “It’s been all right with me but it's not home,” she said. “I would rather be in my own house but I had no other choice. I had to stay somewhere, and so this is where I landed at right here." Thompson will turn 96 next month. She wants to celebrate that birthday in her own home. That might not be possible. But this week, the Killens family got some good news: A landlord agreed to rent them a house. It’s only temporary, but soon they’ll be among the lucky survivors who don’t have to live in motels any more. Victims of Hurricane Matthew are getting much needed relief. Governor Roy Cooper announced the state would be getting $198 million in federal grants from the U.S. Department of Housing and Urban Development. The town of Nags Head is asking the Federal Emergency Management Agency, or FEMA, for help to restore 1.4 million cubic meters of sand along its shoreline after Hurricane Matthew. UPDATED Tuesday, December 13, 2016 at 7:05 p.m. The state House voted unanimously Tuesday night to pass their version of a disaster relief measure. The bill goes onto the Senate for further debate Wednesday.